Six-hour five spice pork belly, miso mustard, apple and ginger salsa and walnuts. An exhilarating taste journey begins upon crossing the border into Fu Manchu Oriental Kitchen, a recent addition to the trendy dining scene found on Chevron Island. 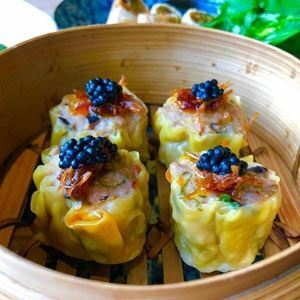 Drawing locals from across the Gold Coast to try an array of cuisine, Fu Manchu offers a fusion of influences in all aspects, designed with ambient dining in mind. Discovering a place among a moody setting of dark tones broken by vivid aqua and exotic features, guests may need time to roam a menu of captivating plates. Perhaps settle on a dish of each variety spanning the likes of sesame crusted yellowfin tuna, avocado, watercress, wasabi soy and nori; salt and pepper tofu salad, snow pea tendrils, pickled fennel, nashi pear, watermelon radish and balsamic soy dressing, as well as sticky master stock braised lamb ribs. Great food and atmosphere! Will definitely be back. One of the best on the Coast! A great find. This has to be one of the best Asian restaurants on the Coast! Food is creative, considered and packed with subtle flavours. A real delight. We had a quick Monday night meal and loved it !! We will be back !! The reviews were right ! The hype around new places can be just that. But dining at Fu Manchu is an experience. The decor is sensational. The atmosphere inviting and fun. The service exceptional and the food simply amazing. I don't think this will be a regular for just myself more than a following of people who who enjoy an awesome experience all round.